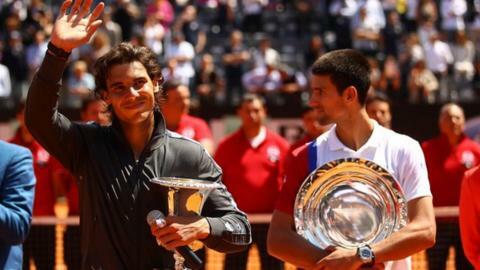 Rafael Nadal beat world number one Novak Djokovic in straight sets to win a record sixth Italian Open title. The Spaniard won 7-5 6-3 in the final, which had been delayed by a day because of rain in Rome on Sunday, to return to second in the world rankings. The duo swapped breaks midway through the first set before Nadal made the decisive breakthrough in the 11th game. Nadal broke in the opening game of the second set and won the match when Djokovic double-faulted at match point. The Serbian had enjoyed a run of seven successive victories over Nadal prior to last month's Monte Carlo Masters final but the Spaniard has now won their last two meetings. Nadal said: "The mentality was there at the right time because I know to win matches against Novak you have to be at your limit all the time because he's pushing you at every moment. "I think I was mentally strong enough to play very well at the important moments." Nadal opened strongly but wasted two break points in Djokovic's opening service game. However, he made amends in the fifth game, punishing a poor drop shot to take the initiative but a lacklustre service game allowed the defending champion to restore parity. The turning point came in the 10th game when a Djokovic shot, that would have given him a set point, was called out by the line-judge, only for the umpire to over-rule the decision. Nadal won the replayed point - and Djokovic received a warning from the umpire for smashing his racquet at the change of ends after the Spaniard broke to go 6-5 up. Nadal served out the set before breaking again in the opening game of the second set and the Spaniard then saved six break points in his next two service games. A wide backhand from Djokovic, who made 41 unforced errors, set up match point and he handed Nadal the title with a double fault. Djokovic said: "I made a lot of unforced errors. In my opinion I don't think he played extremely well but I made a lot of errors that can't happen when you play against Nadal. "I will go to Paris with a good level of confidence because I played a great week, especially the last two or three matches, so I hope for the best there."